A couple people have asked about it, so I added the shiny poster to the store. The shipping makes the price a little steep for a poster all by itself, but I’d be happy to add up to two more per order for $8 USD each (the card paper is thick, so I’m not sure if four or five will fit into the tube!). 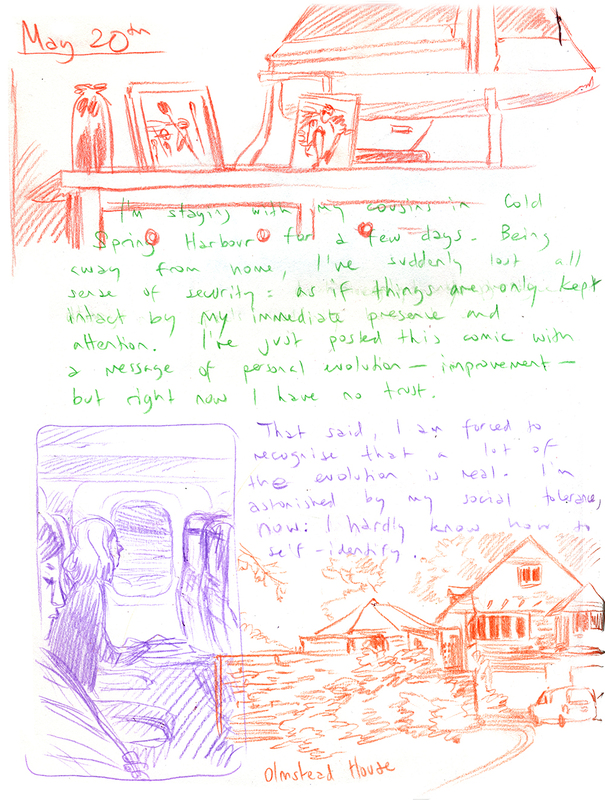 I wrote some diary comics for a class assignment earlier this year. I’d never previously had much interest in diary-anything, but I found the exercise really interesting and helpful so I’ve repeated it a few times since. I have mixed feelings about the results. For instance, I find it really hard to walk the line between self-censorship and over-sharing. It’s a narrow line, at least for me, and much easier to navigate in fiction. But I keep coming back – one of my classmates told me it all read like a sort of profile, which I liked – so here are some entries, and you can find the first set on my Instagram. Update: I’m amazed to say that I’ve already sold out! Thank you to everyone who made a purchase – I’m excited to do the sketches, and I’ll get everything mailed by the end of next week. 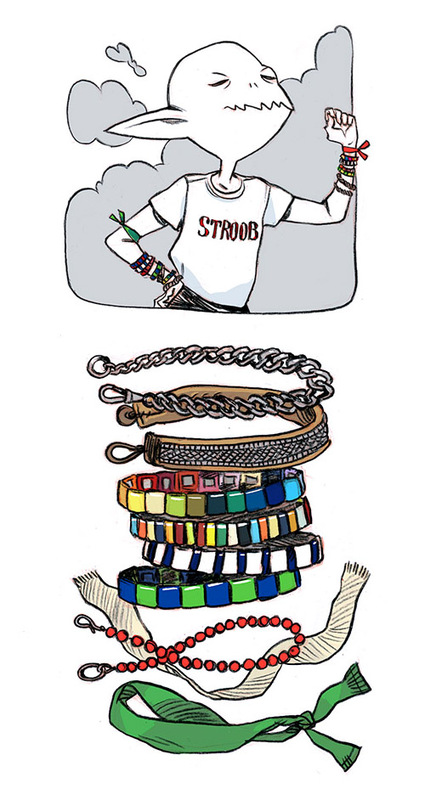 I’ve updated the store with a second round of art, for anybody who missed the first lot. The Hchom Book is out, and I wanted to do something by way of celebration, so I thought I’d put together an art sale with a promotional poster thrown in. I’ve never made a poster before, so I’m very excited about it. Posterposterposter! This round, I’ve figured out a real sales page with real paypal buttons, so you don’t have to email me and ask about stock. But please feel free to email me anyway, especially if there’s another illustration you’re interested in. I can check to see if I have it stored away somewhere. The Hchom Book is coming out in a little over three weeks, on September 25th! This is what I’ve been working on (with much love and obsession) all summer. It collects most of the Hchom archives, but is also peppered through with new artwork, and I hope very much that you like it. Here’s the amazon link for a start, but of course I encourage you to pester your local comic book shop and see if they’re willing to order it in. I have plans for a fun, supplementary project in some form, and maybe an art sale to launch it all, so more on that as September progresses! 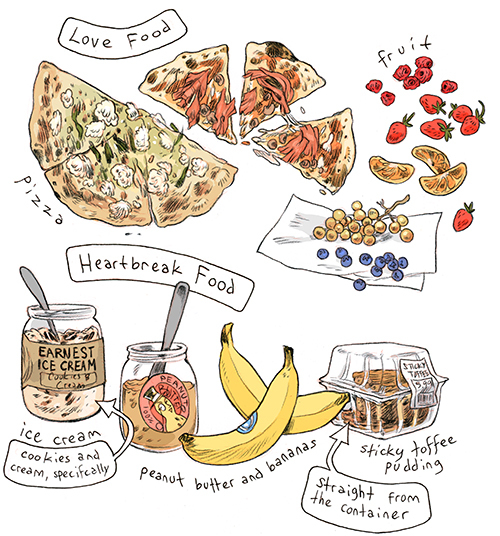 I was listening to Dolly Alderton’s “Love Stories” podcast the other day, and she asked one of her guests (I’m paraphrasing loosely) what foods she ate when she was in love, and correspondingly what foods she ate when she was heartbroken. I liked this a lot and wanted to add my own version to the Hchom book, extending the list to include other categories. Yes, I am one of those disgusting people who gorges while reading, and you can suss out my favourite books by their smears! I also wanted to post the list so I could get everybody else’s input. I think the question can be loose: what are your associations from a specific meal, or what foods do you crave in general when working, in love, etc.? I should add as an aside: I view “love”, here, as encompassing friends and family and whatever else, in addition to classic romantic love. I mean, I’ve consumed some exceptional pizza while spending time with The Elder Scrolls. I was recently reminded that I’m due for a birthday want list, so I’ve placed it at the top of the queue. Here is my Instagram, as promised. Thank you to everybody who commented on the previous post – and again, to everyone who has visited over the years. I will do my damnedest to make a book for you! I’m going to keep the site up a little while longer, for ease of reference, but it’s now officially an archive. Please imagine dust and echoes, as you scroll. 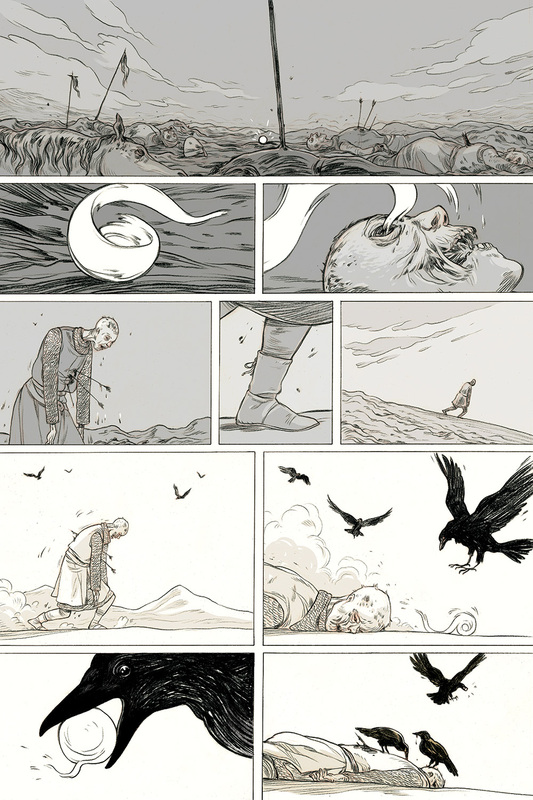 This is just a quick post to say that The Beguiling, in Toronto, sells my original comic pages. Why have I never pointed that out, before? Because I’m bad at PR, I guess. Anyway, I just sent them a bunch of my big, fully painted covers, so here’s the link to that. A while back, a nice director man made a short film based on my old Meathaus comic about a dying dog. Now the film has been posted online, and you can watch it here. I must say, the passage of time makes this no less surreal. I’m sorry to have missed Wednesday. I suppose I’d better accept the inevitable slide into more casual posting, as I move deeper into other projects. Some people are good at juggling many pins, but I have enough trouble throwing one in the air and then catching it again when it falls. Anyway, here are some life drawing sketches. I did a drop in session last week for the first time in, I dunno, maybe not a decade but close enough, and I could practically feel the electricity moving through dormant parts of my brain. I’ve decided that my witch collects skulls – from her slain enemies, of course, but also from any old corpse that she comes across. 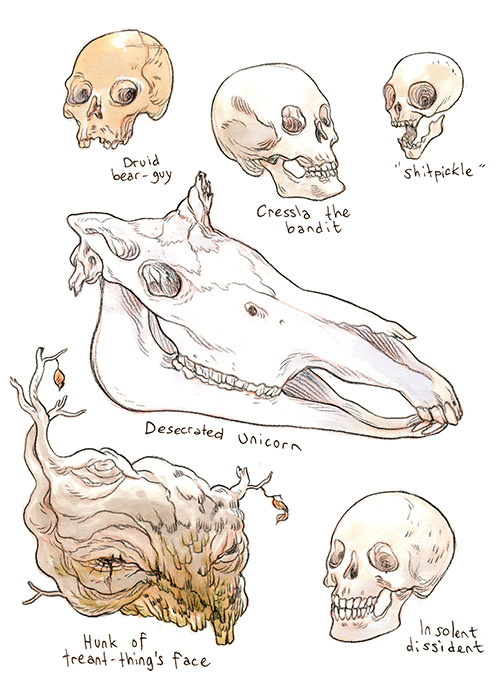 Allies’ skulls, whatever. If her sister died, she’d probably take her skull too. So in lieu of a proper level five character update, which I couldn’t quite manage in my day of pre-travel errands, here’s a selection of her trophies (I’m not very diligent about taking notes or recording names, as you can see by my creative labelling). These are, of course, destined to line her caster’s tower. She’s the kingdom’s magister (I say D&D, but we’re actually playing the Pathfinder Kingmaker campaign), so as my GM points out, this might repel the general populace, but that just makes it extra delightful. She’s a repellent lady, my witch.